Oh June! I didn’t know you had such a hot temper. First you came with open arms and roses and candle lighted dinners on the deck. You were beautiful, pleasant, and funny. You were the answer to our prayers after harsh cold winter days. Mornings with you were cool and breezy. Mornings with you had a scent of the beach and shells and fishermen coming back from the sea. Mornings with you were lovely. We opened our house, our windows and our kitchen to you. The curtains were pulled all the way to the ceiling. The winter clothes were buried in the basement. Hairdressers were busy. Children were free. We went to the park together and you delighted us with tender asparagus, crunchy radishes and sweet strawberries. You told us stories about friendship and riding bikes and festivals and scraped knees and picnics and how you liked being on the spotlight announcing the summer season. We laughed together. We raised our glass to you. You gave us more strawberries. But then everything changed. Something must have happened. Someone must have upset you. We must have upset you. You left. August came. You said it was just for a day or two. It has been more than a week and you are still away. Different. Upset. Hot. Humid. Angry. Thirsty. Rude. Pitiless. 95. We shut down our windows. We pull down our curtains most of the day. We drink and we are still thirsty. We huff and puff and drink and we are still thirsty. You threaten my kitchen garden. You threaten my sweet bread. You threaten my hometown and scared my mother. You gave me a sunburn on my shoulders. You leave my daughter wearing onesie all day long; leaving her beautiful pock dot dresses buried in her closet. We consider living under the shower. We consider living in our basement. We think about shutting down the stove and lighting up the grill. We think about going to work in shorts and flip-flops. We think about spending our day “farniente”, stretching our hand just to nibble and spread…and maybe gulp some ice cream to cool your hot temper down. If I had to list my favorite summer food, olives would definitely be on my top five. No doubt about it. I like to eat oil-cured olives, also called Moroccan olives, with a piece of crusty bread and a glass of fresh, cold lemonade to wash everything down. This marinade is very easy to make and has become a staple in my house since the beginning of spring. Warm spices with fresh herbs complement the olives and give them another dimension of taste and warmth. Muhammara is a Bell pepper and walnut spread originated in Syria and is very popular in most of the Middle East. I don’t remember how this addictive spread came into my life, but I’m glad it did; because the minute a spoonful of it laid into my slice of bread I promised my self to set a date for another batch of Muhammara. June goes much smoothly with olives and muhammara on the table. In a food processor blend together the peppers, the breadcrumbs, the walnuts, the garlic, the lemon juice, the cumin, the red pepper flakes, and salt to taste until the mixture is smooth and with the motor running add the oil gradually and blend very briefly to a rough, slightly chunky paste. Transfer the muhammara to a bowl and serve it at room temperature with the bread. Muhammara should be stored in an airtight container in the fridge. Rinse the olives two or three times under running water to remove the excess brine. Set aside to drain. Put the remaining ingredients in a mortar or a bowl and mix enough to combine. Pour the marinade over the olives and stir well. Let the flavors develop for at least 1 hour before serving. * Most Middle Eastern stores have a good variety of olives for a fair price. My favorite variety is the oil cured black olives; sometimes called Moroccan olives. Dans un robot ménager, mélanger les poivrons rouges avec les noix, ail, le jus de citron, le cumin, le piment jusqu’à une consistence onctueuse. Avec le moteur en marche, verser l’huile d’olive en filet juste assez pour que le mélange prenne du volume mais reste riche en petits morceux. Mettre la Muhammara dans un bol et servir avec des morceaux de pain pour tartiner. Muhammara se conserve mieux au frigo dans un bocal à fermeture hermétique. Rincer les olives deux ou trois fois sous l’eau coullante pour enlever le plus de saumure possible. Laisser égouter. Mélanger le reste des ingredients dans un mortier ou un petit bol et bien mélanger. Verser la marinade sur les olives et laisser les aromes se connaitre entre elles au moins une heure avant de servir. There's no middle ground, is there? In Seattle, we've been having March (with a couple of days that zoomed into summer before reverting) since, well, March. We're still wearing sweaters and sometimes down jackets. 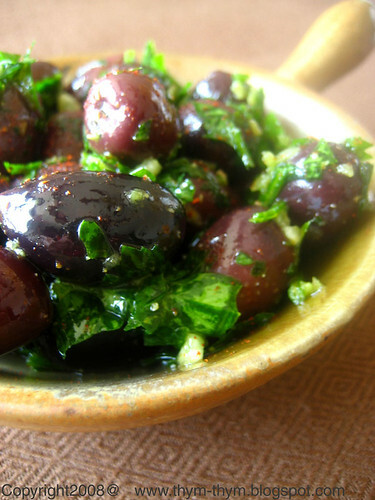 I love recipes for marinated olives; this looks great. You are a rare talent, Warda. Your writing is evocative, your photos are gorgeous, and your recipes put us all to shame. I should be jealous.....very, very jealous of you. But, sigh, you are just so nice that all I can be is grateful. Oh, I love the direct address to June. It is a mercurial month, isn't it? And you've captured it perfectly. I just discovered your blog. So lovely! …! Beautiful pictures . Summer in Algeria!! Summer…:-(. We're still wearing jackets here in Oulu. Your marinated olives look so tempting! Today is a nice cool day, finally! I am making your granola which is filling the air with the smell of cinnamon and cardamom while it is toasting in the oven. I read this post and the marinated olives and muhammara sounds so good I can imagine the smell of cumin and clove added to the wonderful smell of the granola. If I could I would come to your house every day to eat. Thank you for inspiring me with new flavors and culinary ideas. Warda, you should get published, my friend. Seriously. Last week there was a special article in one paper about olives. I read it and came to the conclusion it would be impossible for me to give olives up if I ever had to. I absolutely love them! I'm convinced this weather is out to get me! ;) One night it's hot as you-know-what and the next it's storming like crazy. 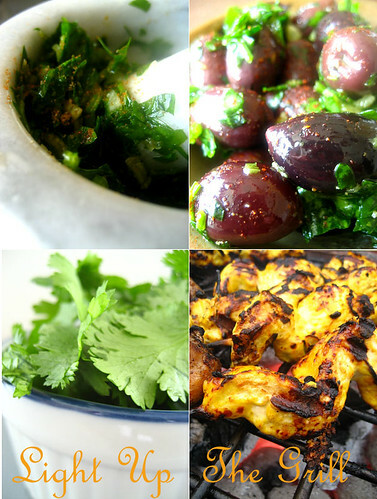 I loved the simplicity of this marinade - the olives look so good! 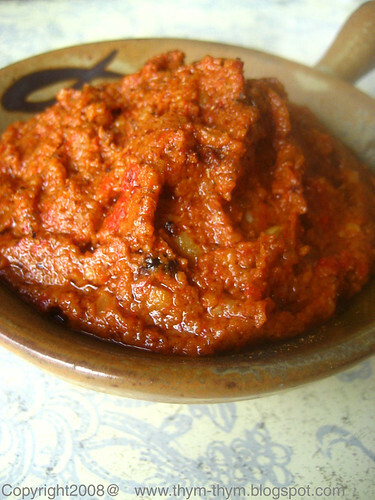 I love the muhammara you made- I need that with some fresh farm bread and grilled chicken! just stumbled upon your blog through links from other food blogs I read, and I must tell you how much I enjoy it! you're photographs are scrumptious, your recipes seriously make me want to visit morocco, and your text fills me with the desire to learn french, finally! I hope it's ok that I linked you on the favorite food blog section of my blog! Tu n'as pas honte de nous faire saliver dès l'ouverture de ton blog?? Ces préparations sont idéales pour mettre en appétit,et elles accompagnent très bien les grillades...vive l'été!! Un grand merci Warda,quel talent(khamssa ou khmouss 3lik...) ou vas tu chercher tout çà?? - Maryam, thank you! Thank you! Thank you for your words of encouragement and your kindness. - Susan, thank you very much! - Colleen, it is funny to think that while we are roasting here under the sun, eating only salads and fruits and drinking gallons of water a day, here you are needing gloves, lighting fires and making spicy wintry stews :) Save one pair of glove for me when winter comes my way. I'll save you a shady spot just for you when summer comes your way. Warm hugs, my friend. - Shayne, how was the granola? Hope you enjoyed it. If only we were next-door neighbors, I would pretend any excuse, like "I need some salt, or eggs or a hug, to come see you, and have lunch and dinners and lovely moments together. But though we're not very close to each other, my doors will always be welcome for my friend. Come whenever you want. I'm serious. - Christine, I think it's out to get us all ;) But you and Pierre should take care of yourself when you are out taking photos. Don't forget hats, sunscreen and lots of water :) I'll bring muhammara to our next picnic. - Mima, tu n'as qu'a venir. Je viens juste d'acheter des olives. j'ai ete a la bonne ecole. Je dois beaucoup a ma chere et tendre maman de m'avoir fait aimer la cuisine en particulier et la vie en generale. Bisous. Bisous.Love. Your olives and peppers look really beautiful :) as usual ! I had some muhammara for the first time at a restaurant the other day - I commend it to everyone! And big, fat, juicy, marinated olives - yes, please! Je crois bien qu'au prochain apéro, je penserai à toi ! Oh Sweets! Here we have 100F in the shade at 6pm...we installed outdoor fans with water mist on them...and the kids are spending their time playing with the grass sprinklers!! Thanks for such great nibbles! Oh how I wish to get some of the warm weather from you - can you please send me some. It's been such a cold, wet and windy weekend here in Sydney. I love these recipes, thanks for sharing. I am delighted to discover that I marinate my olives like yours with caraway seeds being the only extra ingredient. But I am sad to say that I have never tried Muhammara. Definitely a must for my next BBQ. Merci! Funny that, June is throwing April tantrums here in London! wow this is so lovely, so incredible, I just love it! tu es vraiment douée! ces petites idées sont idéales pour l'été! a beautiful post. I loved reading it. But you know, 95 is about average for us during summer. :-) I love the long hot evenings during this weather. Esp at the beach. on a tartiné puis grignoté et mème avalé...que doit on faire d'autre ? Warda, what a wonderful blog! I found you through the Lady Bloggers invite. Your writing, recipes and photos are all stunning! Can you please explain "farn niente"? - Thank you all for your sweet comments. Glad to see that my olives and muhammara pleased you all.